Also, Smokenator makes a "Hover Grate" that's 18". I bought this for my Master Touch and it added a lot of space. I did about the same thing for my 26er with a used 22.5 grate and some hardware from Home Depot. Yeah, back when I was competing, a guy had a bunch of extra WSM 22.5 top grates. Picked one up for five bucks Then I headed over the Depot for some long bolts and assorted nuts and washers. I have both. The 26 is my recommendation. You cannot beat it for size, versatility, and value. Tonight is a good example. 2 equal zones. There simply wouldn’t have been enough room for sear and indirect on a 22. An sns would not have worked either in the 26. Not enough sear area. I have owned way to many grills over the past 25+ years... some being awfully nice grills. I went for quite a few years with no Weber kettle in my cooker lineup (sad, I know). Well, I bought a 26.75 last year and have come to absolutely LOVE it. I have owned both the 18.5 and 22.5 WSM’s and I much prefer the 26.75 kettle for its ease of use and versatility. I vote kettle! Big Dawg, good call using the 22.5 grate, I like the looks of that. I’m getting a 26 for Christmas and might just have to borrow your idea. 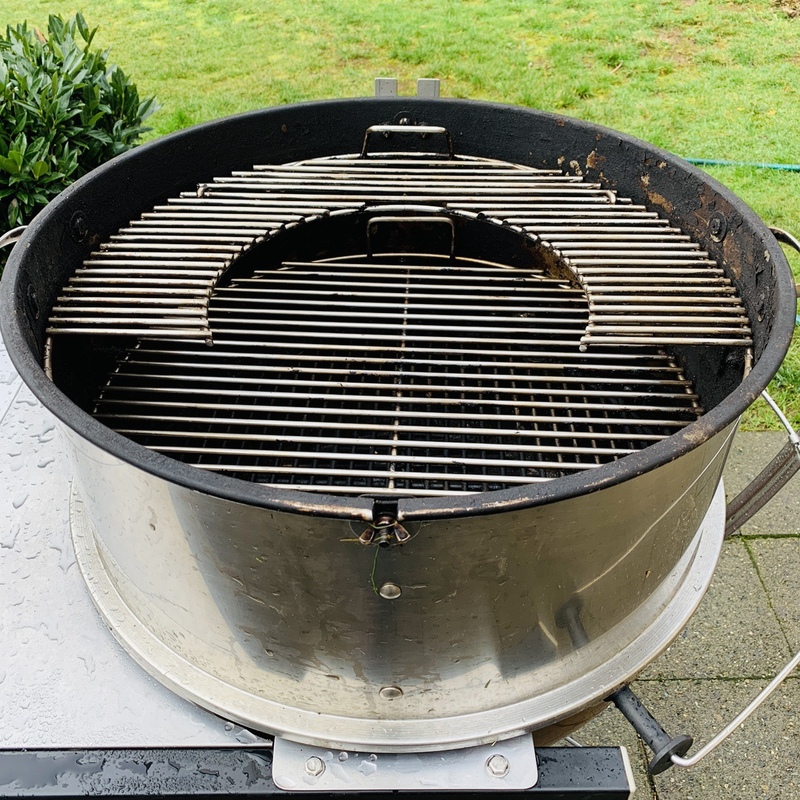 I’ve used the hover grill in the past, but this to me looks to be a more sturdy option. Plus, I think you can get the parts together for it a bit cheaper than a hover grill. Not to hijack the thread here...but I like @Big Dawg stacked grate there. I'm wondering if maybe i could do the same on my MT with an 18 or even a 14 in grate from a SJ? Something to contemplate for those cooks when I need more space! there are some personal choices to make the decision. Storage space, versatility, cooking space, etc. that comes into play. That's some of my thoughts. maybe your age, physical abilities may come into play. 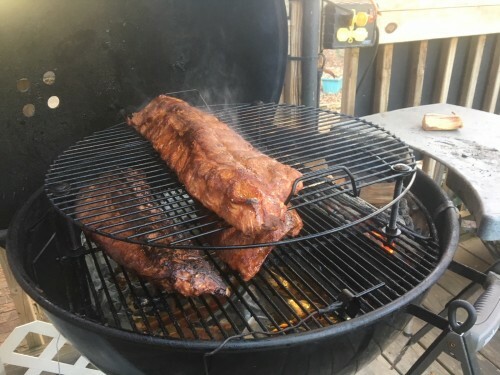 I sold an 18" wsm and opted for a 22" kettle and spent more on it for a temp controller as your having to play with vents moreso than a wsm, today I set the temp and let it go, no need to play with vents. 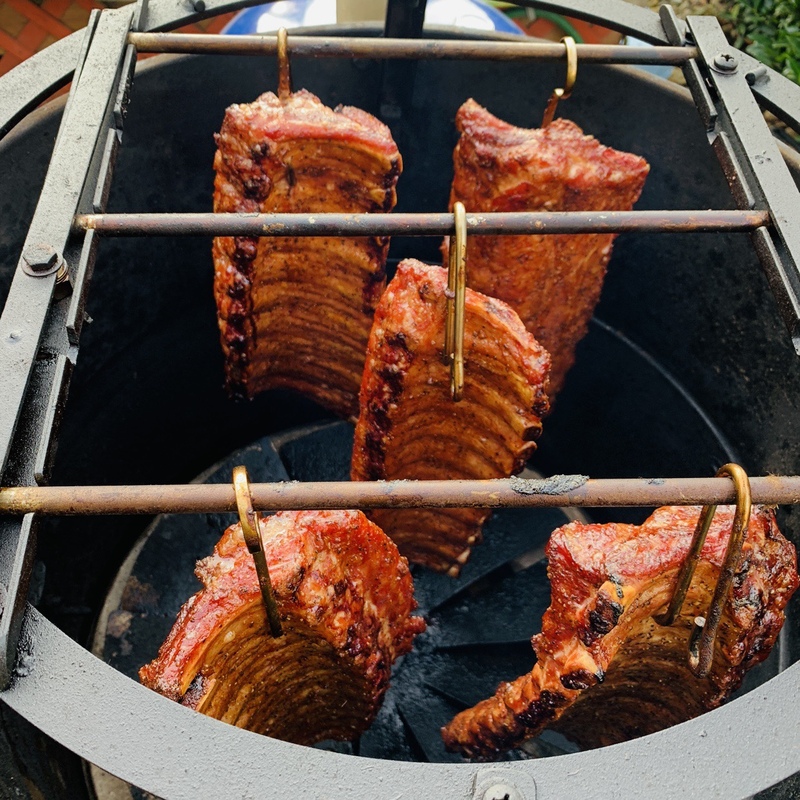 Of course the well-versed smokers HAS more hands-on experience than I ever did which was not much at all smoking something twice a year. 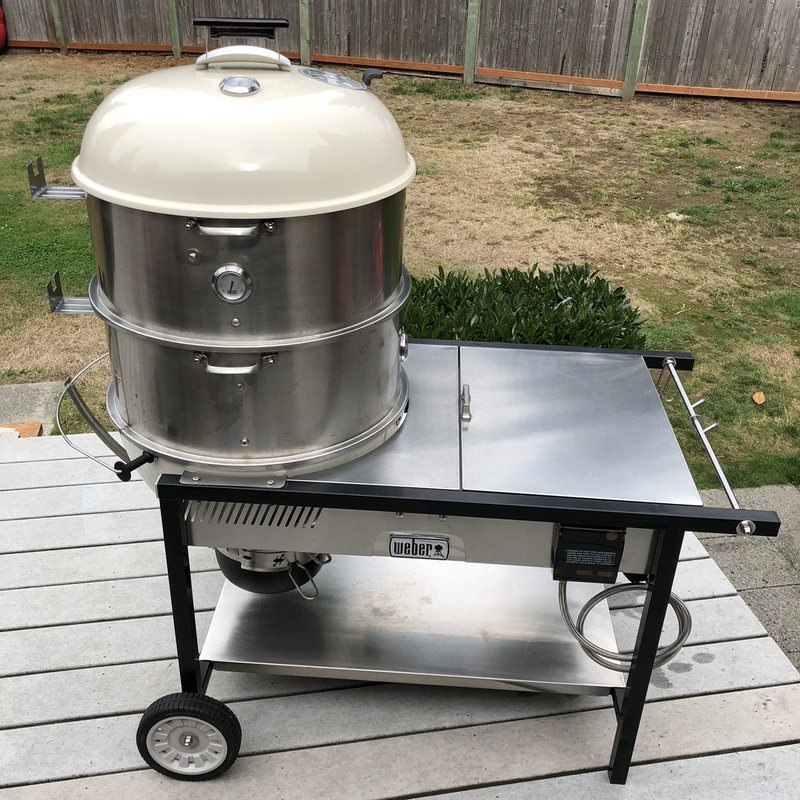 for me it came down to setup and breakdown of the wsm as I didn't have space for a stationary wsm, maybe could have come up with adding wheels? But then again your still having to breakdown to clean the charcoal bowl and water pan(if used and it was heavy, at my age). Lost smoke cooking space but the kettle offered me less physical work at my age. I'm feeling torn right now. Do I buy a 26" kettle or a 18.5 smoky mountain? I have a 26" kettle and a 22.5 smokey mountain plus 3 22.5 kettles. I also am thinking about picking up an 18.5 smokey mountain. Any way you look at it, both or all 4 are a win win situation. I would think that either the 18 would probably work, I'm sure that a smaller one would work. One thing to keep in mind, whichever size you end up with, is that the upper deck can get quite a bit hotter than the main grate. 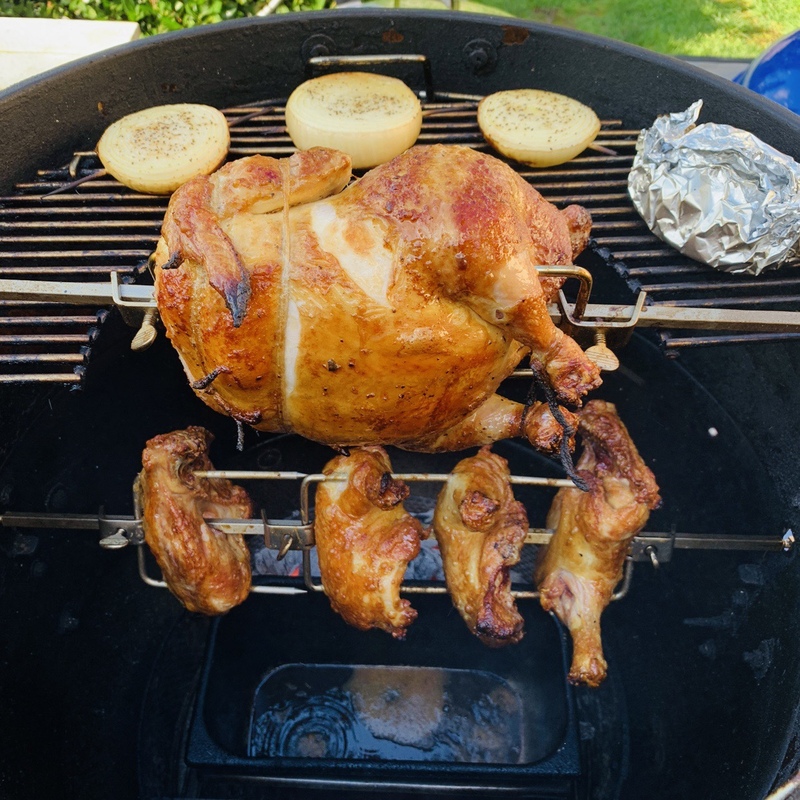 So make sure that you have a plan on how to rotate your proteins, or (even better) cook two kinds, with one that can some off earlier - for a snack ! ! ! 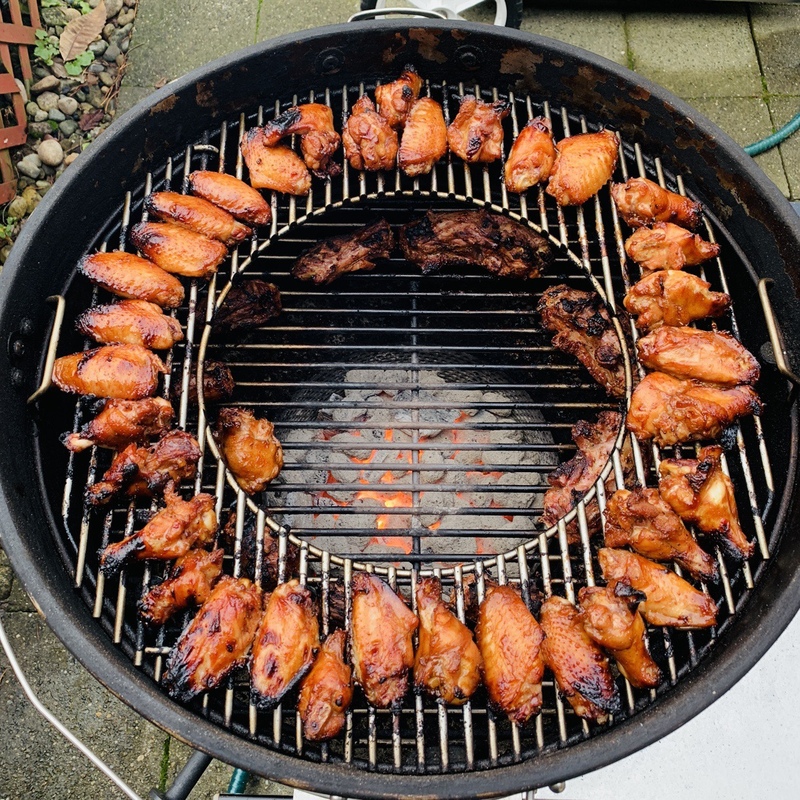 You can always get a couple of stackers for your 22 kettle and you'll end up with as much space as a 22 wsm. Extra room for indirect/semi-direct also.